How many cans of beans or bags of rice are enough? How many MREs? Jars of olives? Artichoke hearts? Feeding oneself in a crisis is a top priority; hence, preppers focus a lot on food, and by extension, growing it. Yet many of us don’t have the space – or aren’t allowed – to grow where we are. At one point, my wife and I were in between locations and tight on finances and spent some time renting. Though we knew we needed to prepare and had stockpiled what we could, digging a large garden or planting anything long-term was impossible. However, we found that there were more ways to garden – and harvest fresh foods – than we thought. Are you in a similar situation? Then this post is for you. Today I’m going to share three ways you can keep food rolling in even if you don’t have space to grow on your own land. This is probably the most obvious method of getting around land restrictions. If you’re in an apartment or, God forbid, a regulated community, containers are your friends. I’ve grown tobacco and peppers in pots, spinach and beans in big plastic bins from Walmart, kept tomatoes going in 5-gallon buckets and even planted a water garden in a discarded bathtub. The downside to most containers is that they are subject to drying out or flooding; plus, their limited capacity doesn’t allow you to pull off some plants with big root systems. With some tweaking, however, you can often make containers that are “self-watering.” Look that up and you’ll be amazed by the innovations created by clever gardeners dealing with tight spaces. One problem some people face with containers is a lack of good soil. Not all potting soils are created equal. When I first started fiddling around with gardening, I bought the cheapest dirt I could find… and had terrible results. Yellow plants, stunted growth and soppy drainage were the norm. Some of the so-called “soil” for sale is little more than sand and wood chips in a bag. Worthless. Unfortunately, it’s hard to get around your need for potting mix. If you simply dig up your local dirt and garden in that, it often doesn’t drain well enough for most plants in a pot. What works in the ground may be death in a pot. You need something that will retain air and moisture without getting soppy. That’s why most good potting soils contain a mix of vermiculite or perlite with peat moss and some compost. Light and airy is key. 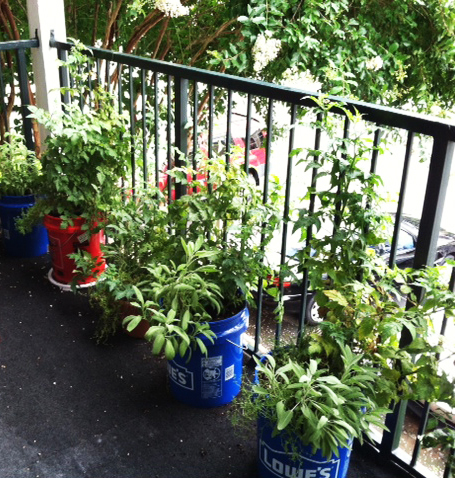 Another thing to consider when growing in containers: cultivate plants that last a while and yield well for the space. For example, if you have a choice between bush and pole beans, choose the latter. Bush beans are nice in long rows, but have a stupidly small yield in a pot. Waiting 60 days for eight beans is rather silly. If you put up a trellis, however, and plant something productive – like snake beans or other pole beans – you’ll be picking for a longer season and eating a lot more for the space. This raises another good point on gardening in small spaces: by going vertical, you gain a lot of space. Cucumbers are excellent for patios. You can even pull off cantaloupes if you’re clever. Even if you just want a source of fresh greens and aren’t willing to tend long-term plants… a half-barrel planter filled with kale, lettuce and spinach is a good way to add to your health during an extended downturn. A lot of people aren’t interested in preserving their harvests or even in doing more than eating the occasional fresh fruit off their trees. Plenty of great trees were planted by long-dead homeowners and ended up an unappreciated denizen of another owner’s landscape. I’ve seen great pecans growing behind a Taco Bell… sampled kumquats in a commercial property by the highway… and visited a venerable old fig tree growing untended at the edge of a church parking lot. Sometimes you can simply show up and harvest, as in the case of foreclosure properties or trees on public land. Most of the time, however, you need to get permission. Walking around the neighborhood and making friends is a great way to start. I’ve had baskets of pears and bushels of citrus just for the asking. The former were turned into brandy… the latter, juice and marmalade. Another form of modern gleaning is dumpster diving. A lot of produce hits the dumpster in perfect shape. If there’s one bad potato in a bag, the whole bag is tossed. The same is true of apples and other fruit. When I lived in the city, a friend and I had a couple of regular routes worked out and we ate better than we had any right to. Plus, if you know how to can or dehydrate, you’ll be able to eat year-round without ever digging a hole. Just like fruit, sometimes land can be had for the asking. If you dress nicely, speak well and promise to share a little of what you grow, there’s often a landowner who will be more than happy to let you plant a patch of earth on their property. In my neighborhood, there’s a farmer who grows crops across quite a few acres – and he only owns a few of them. Most of the land he farms is lent to him for free just so the property owners can enjoy lower taxes by getting an “agricultural” exemption on their bill. They save thousands and the farmer makes thousands. It’s a perfect match, there for the asking. Though most of us won’t be growing on that scale, it goes to show that there are often workarounds for being landless. I’m currently gardening on my property, on a friend’s property, on my parents’ property and in the expansive backyard of my uncle’s property. 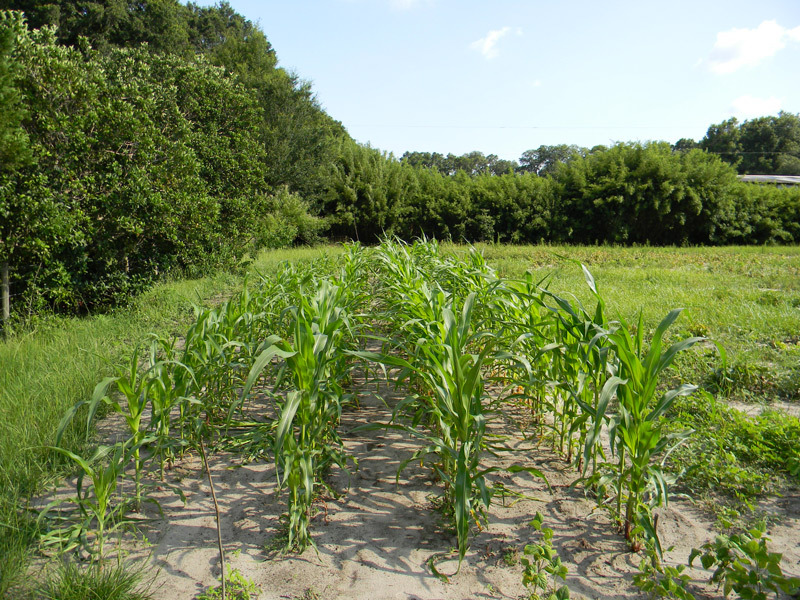 I originally took this route so I could keep my heirloom corn varieties from cross-pollinating, but now it’s expanded into a way for me to feed my chickens and my family without having to purchase more land beyond our modest one-acre plot. Recently I gave a talk to a survivalist group about an hour from my home. They met at a local church and brought in a variety of experts to talk about different aspects of prepping. While there, the pastor’s wife took me around back of the building and showed me the community gardens her congregation (and friends from the neighborhood) had built. There, on a small patch of land, they’d constructed a greenhouse, multiple handicapped accessible tall raised beds, done some work with hydroponics and were planning to start adding trees and other long-term perennials. Not only were they growing food, they were growing relationships. There’s a benefit to that thinking that runs far beyond food production. It means you can share ideas, keep an eye on your fellow gardener’s crops when he or she is away, split fertilizer and compost expenses while pooling your time to attack larger projects. Though the ideal situation is to farm your own acreage, we don’t live in an ideal world. Containers, gleaning and borrowed land provide a few options for those of us who want to bring forth energy and nutrition from the soil but don’t have the space. Don’t let your situation keep you from growing or harvesting food. Keep your ears open for land opportunities, buy a few buckets and watch for overloaded trees going untended. Unless you’d rather eat olive-garnished MREs.